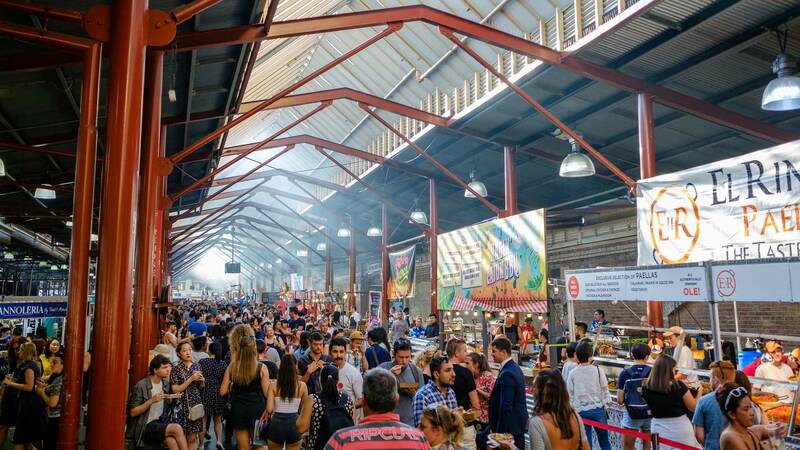 The lull between the end of the Queen Vic Market's Summer Night Market in March and the start of the winter one in June is an annoying one — especially when you've just gotten used to spending Wednesday nights outdoors. To fill that gap, the QVM is launching an autumn European night market for the very first time this April. Get ready for Wednesday night paella, frites, barbecue, currywurst, all with a distinctly European flair, to help you celebrate the end of hump day or forget the disappearing summer. Europa is offering up a lot more than just food at its 20 food and 20 retail stalls. You can escape from the action over a beer at The Brexit Bar, join in at the silent disco or head over to the amphitheatre-style stage which will have live performances each week, all with roots in a new European region. Bringing some Spanish flamenco dancing, Ukrainian egg-dyeing, and French décor to the Queen Vic seems only fitting as the market has been a big part of the culture of Melbourne's European settlers since the 1830s. Europa Night Market runs from 5–10pm.